FX-Sport V2 wireless smart sports headphones with built in waterproof mp3 player. Sport earphones with a purpose made design. Custom speakers provide a rich sound, boosted by the extra embedded amplifier. Playlist names can be personalised and are voiced to you, to easily navigate your music. Comfortable and secure. Sweatproof and rainproof. The FX-SPORT V2 is a set of sweatproof, rainproof and wireless sports headphones with an integrated 8GB text to speech mp3 player to read your personalised playlists/album names to you. Upgradeable to a fully waterproof mp3 player for swimming using the silicone skin accessory. With no wires to tangle or earbuds to fall out, wearable mp3 player headphones are a great design for running, cycling and the gym. Previous models however would break down quickly when sweat entered the unit. Also, navigation through your music was slow one track at a time. Expertly engineered to the highest standards, the V1 is a piece of luxury with superb music quality and a purpose made design adapted from 3 years of research. The fit is just about as close to perfect as there is. Incredibly comfortable, with no “in ear” issues which can come loose especially when sweating, the headphones fit around the back of the head and hook over the ears. Even lying flat on your back [sunbathing, bench press] there is absolutely no interference. 8GB of memory is built into the headphones and text to speech software reads and voices your album names or playlists to you for a luxurious browse through your music. No need for a screen, which can be impractical whilst exercising and no need for a secondary unit to carry. Track change, volume control and fast forward/rewind within a track are also there. The music quality is superb and there is the option to adjust bass and treble to your taste. A description of how to use commonly bought audio books with the headphones is also available. Our methodology will allow you to section a book into as large or as small a file as you like. Fast forward or rewind within each file allows you to skip or rewind if you missed something. 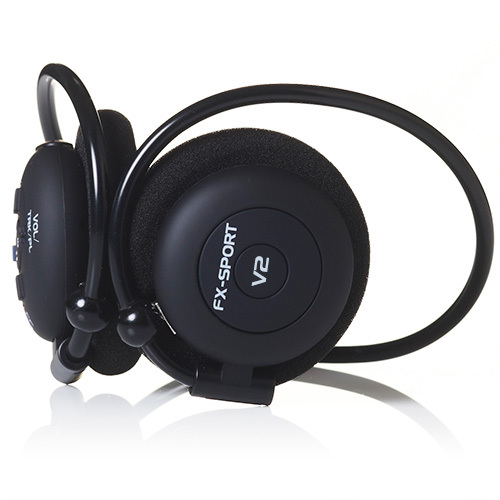 The mp3 player headphones play MP3, WMA and AAC [I-Tunes] format and are compatible with PC and MAC. Inspiration and freedom at last, for athletes and exercise enthusiasts everywhere.